News flash: even more recent updates to this information are available to subscribers to the full Technology User Profile service. Where do you spend your waking hours? 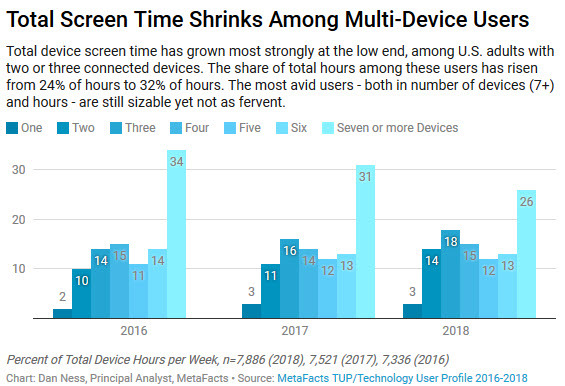 For most Americans, looking at a computer screen is the growing answer. 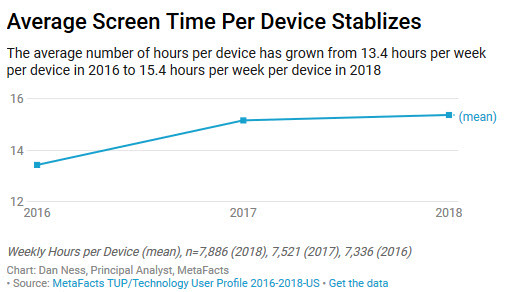 More of Americans’ time is with their computers – both at home and in the workplace. 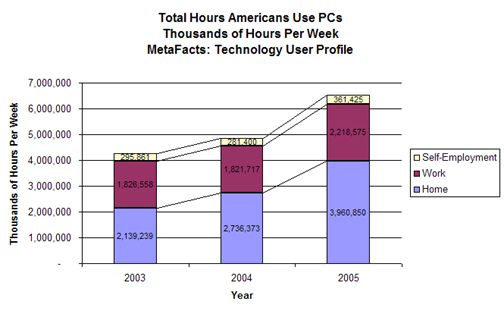 On average, Americans spent 25.9 hours a week using their PCs in 2005, up from 24.5 hours a week two years earlier. 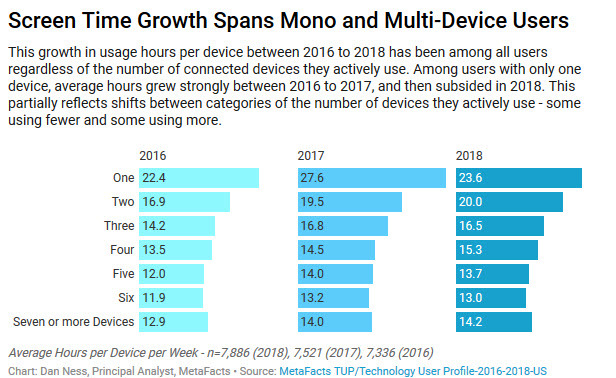 Both home and workplace PC usage levels have continued to grow in the last two years. As Americans integrate computers even further into their lives, the implications are wide-ranging, from their ergonomics and health, to privacy and national security, and even social interaction and consumerism. Besides the PC, software, and Internet companies, it also impacts media such as TV and radio that chase the attention of Americans’ eyeballs. 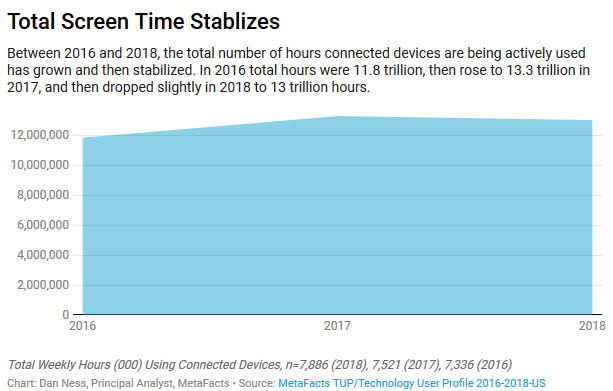 The total number of hours Americans use computers has climbed to 6.5 billion hours per week in 2005, up from 4.8 billion hours in 2004 and 4.3 billion hours in 2003. This is significant, representing 1 out of 7 total hours in a week, up from 1 of 12 only two years prior. To put this further into perspective, this is 20% of all waking hours, up from 13% only two years prior. In the workplace, some occupational groups use computers much more than others. 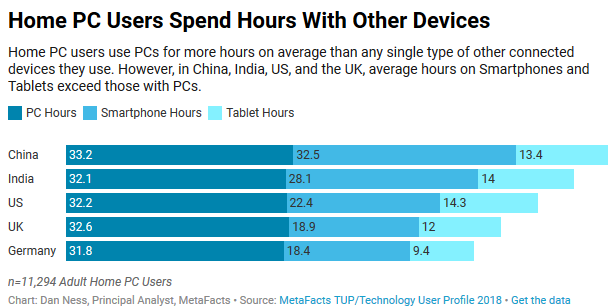 It’s hardly a surprise that Computer-Related occupations lead all Americans in their use of work computers, with an average of 37.6 hours per week. Since this is nearly all of a standard 40-hour workweek, we have to wonder if they’re having their lunches at their desks. More likely they’re working more hours than average. Employees in Accounting & Finance jobs also use computers more than most, at 35.2 hours per week on average. In their case, it’s about spreadsheets – lots of spreadsheets. 79% of these employees cite spreadsheets as a regular computer activity, compared with 36% of other PC users. At the other end of the spectrum, some occupational groups use computers less often, at nearly half the rate of the busiest. 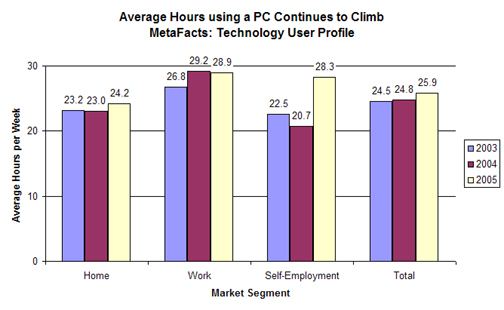 Of the Construction/Labor employees that use a work computer, the average is 21 hours per week. This is only slightly higher than the lowest group, Education/Training, who stand at 20.6 hours per week. Evidently, instructors spend more time in front of the classroom instead of their computer. 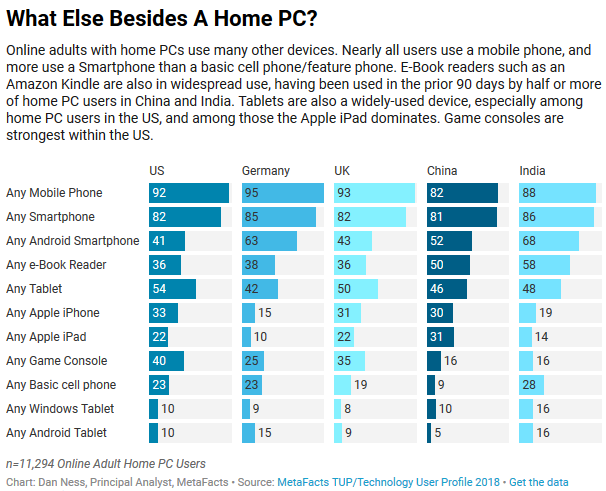 Although the primacy of the PC isn’t assured forever, Americans continue to find ways for their PCs to be a big and growing part of their lives. This is a good sign for the health of the computer industry.